When it comes to gaming, visuals play a very important role, but so does audio. Over the years, game developers have paid an equal amount of attention to audio details, and high quality headphones that help convey the in-game environment to gamers do their bit to help, too. Creative Labs has once again broken new barriers in gaming audio with the Sound BlasterX G6, touted to be the best gaming audio upgrade for consoles such as the Sony PS4, Nintendo Switch, Xbox and of course, the PC. This is far more than a regular USB sound card, the Sound BlasterX G6 is a high resolution gaming DAC and USB sound card complete with Xamp headphone bi-amplifier and Dolby Digital decoding, enabling gamers to hear far more detail from games that they are already familiar with at the moment. In other words, you will have to listen to it to believe such claims. 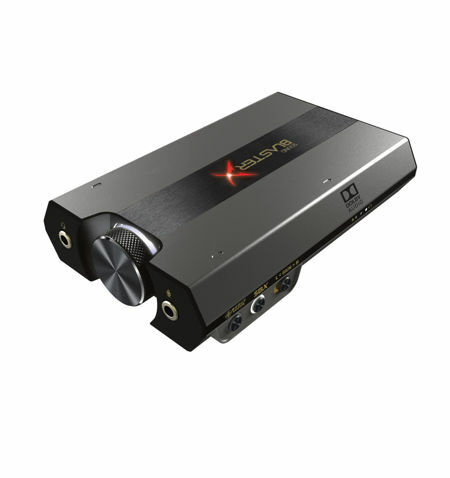 The Sound BlasterX G6 is capable of 32-bit/384kHz PCM and DoP playback, where it has been built using precision audiophile components. This delivers an outstanding audio upgrade from default audio on the PS4, PC, Xbox, and Nintendo Switch, where its custom-designed Xamp discrete headphone amp makes use of bi-amplification technology in order to power each channel individually, resulting in an entirely new level of audio fidelity with superior clarity and accuracy, all within the confines of an unaltered lossless model. Being versatile is also another of the Sound BlasterX G6’s strengths, since it works with so many consoles, playing nice with the Nintendo Switch even in USB Dock mode. Boasting of support for hi-res audio formats such as 32-bit 384kHz PCM and DoP audio formats, all in-game music will be delivered with true authenticity and accuracy. Expect to raise your gaming experience to a whole new level with the $149.99 Sound BlasterX G6.